Hayden Kho and Vicki Belo’s daughter Scarlet Snow turned 2 today, March 3 and the proud father shared a heartfelt message for her on Instagram. “What is time but a measure of memories? Two years ago today your arrival changed me and filled my life with beautiful memories. My soul expanded because of you. I recall how when you first learned how to make sounds you called everything "ba-er." When you first learned to walk your right arm would always be raised. Feeding you healthy food was easy because you loved veggies and fruits. You shocked us when you learned how to read the whole alphabet at 1yr and 4mos. There are many more... Oh @scarletsnowbelo if you only know how much happiness you are bringing to so many people. I love you so much. Thank you for coming into our lives. Happy 2nd birthday,” he wrote. What is time but a measure of memories? Two years ago today your arrival changed me and filled my life with beautiful memories. My soul expanded because of you. I recall how when you first learned how to make sounds you called everything "ba-er." When you first learned to walk your right arm would always be raised. Feeding you healthy food was easy because you loved veggies and fruits. You shocked us when you learned how to read the whole alphabet at 1yr and 4mos. There are many more... Oh @scarletsnowbelo if you only know how much happiness you are bringing to so many people. I love you so much. Thank you for coming into our lives. Happy 2nd birthday. Thank you #gigicupvakes #manaylolit #avenue cakes for sending @scarletsnowbelo cakes and to all my kasambahay for singing for scarlet . 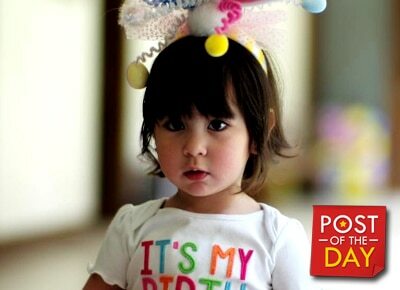 Our baby @scarletsnowbelo turns two today. Please say a prayer for her.?? Just wanted to give you a close up of how kilig @scarletsnowbelo was with the singing .